What is the funtion of Distance/ Angle Divisions? When I use the transform toolpath in NX 10, I see the Distance/ Angle Division item. I don't understand the purpose of this function? Can you explain this for me and give me an example? Thanks! Re: What is the funtion of Distance/ Angle Divisions? This is documented in the online help. 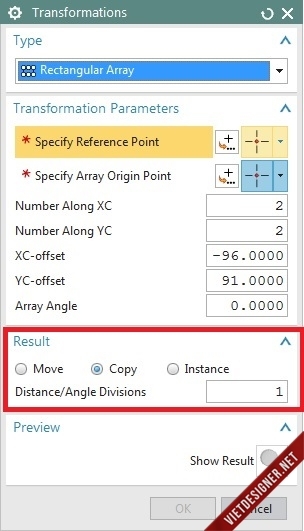 Specifies how many equal parts you want the transformation angle or distance divided into. If you select Move , the transformation is to the first subdivision of the total distance (or angle). If you select Copy , or Instance , each copy or instance is spaced according to the subdivided distance or angle. For example, if you rotate 180 with 3 divisions, the angle is 60 between copies. I find it easiest to use Show result to see the effect. Thanks for your reply, but I don't see the difference when I change the value in Distance/ Angle Divisions box? This does not apply to the angle or a rectangular array. Try it with rotate about a point. I just tried this function with the Circular Array command but I don't see the difference if I change the value in Distance/ Angle Divisions box (I tried with some value as 0, 30, 60, 90 but the result is the same)! Can you make an example for me?